An interesting lecture about Australia’s British Greeks will be presented by Andonis Piperoglou on Thursday 14 July, at the Greek Centre, as a part of the Greek History and Culture Seminars, offered for sixth consecutive year by the Greek Community of Melbourne. The history of Greek settlement in Australia is long and rich. It is a trans-imperial and transnational history that has attracted multi-disciplinary interest and approaches, including greater incorporation within the Australian meta-narrative. However, the formative beginnings of a Greek-Australian presence has often been framed within a fragmented historical context, often limited to narratives of assimilation and contribution. 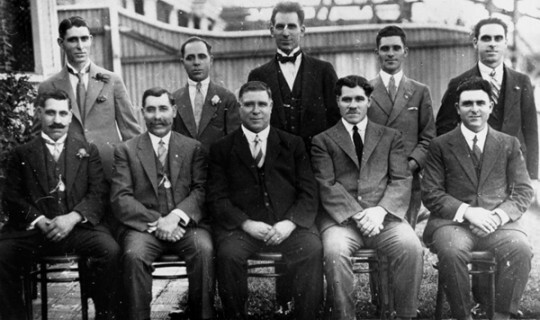 By tracing moments when early Greek community-leaders interested with the colonial, racialized and labour based politics of Australian nation-building this presentation aims to demonstrate that the formation of an early Greek-Australian consciousness often worked in tandem with the shifting contours of Australian nationhood. Through a close reading of public articulations made by the Greek Orthodox Priest Sepherim Phocas (1839-1917), and the foundational President of the Hellenic Association of Queensland Christy Freeleagus (1889-1957) [Photo: front, right], this paper will gauge not only how Greek settlers were represented by these leaders but will also expose how their articulations were intrinsically linked to identifications with Britain, ‘non-white’ racial exclusion and the romantic allure of Hellenism. Such an investigation offers new light on how the making of Australia was affected by the distinctive presence of Greeks within its borders. The articulations of early Greek leaders, I will argue, was particularly significant, especially when considered within racialized economy of Australian labour. In sum, this paper elucidates how early Greeks leaders created a distinctive space for Greeks in Australia by representing themselves, and their countrymen, as indisputable inclusions into the racial cultural confines of the nation. Such an investigation hopes to enrich our historical understanding of ethnic-identity formation and its ties to the politics of race and nation-building more broadly. Andonis Piperoglou has Castellorizian and Cypriot heritage and is a doctoral candidate at La Trobe University. He lectures at the Australian Catholic University and La Trobe University teaching core-subjects which focus on the historical processes of Australian and global migration. He has successfully applied innovative ‘hands-on’ teaching methods which encourage students to critically explore the historical complexities associated with human mobility and identity formation. His thesis Greek Settlers: race, labour and the making of White Australia, 1890s – 1920s, locates the formation of an early Greek Australian identity and its multifaceted relationship to the processes of Australian race-making. Research for this project has taken him across Australia, Greece and the United States. Of particular interest to him are the intersecting transnational histories of mobility, race, and ethnic identity formation in settler societies and the global Greek diaspora more generally. His article ‘Greek or Turks, white or Asiatic: Historicising Castellorizian Racial Consciousness, 1916-1920’ will be published later this year in a special edition of the Journal of Australian Studies tilted Boat People: The Long History of Immigration.